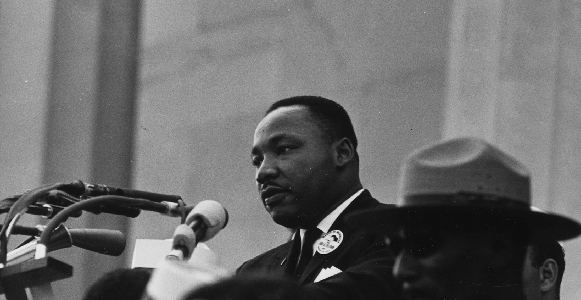 In this lesson, middle school and high school students will read the “I Have a Dream” speech by Dr. Martin Luther King Jr. and compare the civil rights movement with the pro-life movement. Use this lesson in conjunction with Martin Luther King Jr. Day, Black History Month, or a study of the American civil rights movement. The lesson is divided into sections by grade level so that high school students can continue their discussion of the speech in greater depth. Lecture (20 minutes): Read Dr. King’s “I Have a Dream” speech aloud. Discussion (15 minutes): Engage the students in a discussion using the discussion questions provided in the lesson. Activity (10 minutes): Complete the lesson with one of the suggested activities. Understand the definition of solidarity and the role of solidarity in building a culture of life. Compare the civil rights movement with the pro-life movement by comparing the March on Washington to the March for Life. A copy of the “I Have a Dream” speech. It can be found at archives.gov/press/exhibits/dream-speech.pdf. Dr. Martin Luther King Jr. was born in Georgia on January 15, 1929, during a period of severe racial prejudice in the south. He became a minister and completed his doctoral studies in theology in 1955. While studying for his doctorate, King met and married Coretta Scott and together they had four children. At that time, rights were decided merely by the color of a person’s skin. Black people did not have the same rights as white people. They couldn’t use the same bathrooms, participate in sports with white kids, or ride on the front of the bus. Jim Crow laws forced whites and blacks to live separately and not intermingle. It was even against the law for persons of different races to marry each other. Inspired by Mahatma Gandhi and the idea of nonviolent protest for social change, Dr. King became the lead spokesman for a successful bus boycott in Montgomery, Alabama, following the arrest of Rosa Parks, a courageous young woman who stood up against Alabama’s harsh segregation laws. Dr. King soon became a major figure in the civil rights movement, organizing demonstrations in Birmingham, Alabama, which led to his arrest. While in jail, Dr. King penned his famous “Letter from a Birmingham Jail.” One of Dr. King’s most famous speeches was given on August 28, 1963, when he organized his March on Washington for jobs and freedom. The March on Washington was attended by over 200,000 people, and Dr. King’s speech would from thence forward be known as the “I Have a Dream” speech. In 1964, Dr. King was awarded the Nobel Peace Prize for his work in the civil rights movement to create equal rights for all Americans. After 13 years of nonviolent protest, Dr. King was assassinated on April 4, 1968, in Memphis, Tennessee. We celebrate Martin Luther King Jr. Day on the third Monday in January. Dr. King began his speech by referencing Abraham Lincoln’s Emancipation Proclamation, which granted freedom to slaves living in states that had seceded from the Union. Dr. King then reminded his listeners that, despite Lincoln’s efforts 100 years prior, African Americans were still marginalized in society. King stated that when the Founding Fathers wrote the Declaration of Independence and the Constitution, they recognized that the right to life for every man, woman, and child is an unalienable right, alongside liberty and the pursuit of happiness. He said that all the citizens of the United States must stand together and act with urgency to repair the injustices being done to the African-American community, for true peace and tranquility will never exist in America if people persecute their own neighbors and fellow citizens. He also said that the cost of justice should not be violence, bitterness, and hatred. Dr. King continued the speech with his dream for America—that every person in the United States would truly understand and live out these words of the Declaration of Independence: “We hold these truths to be self-evident, that all men are created equal.” Dr. King’s dream was that the descendants of those who had been slaves and slave owners would be together like brothers, that people would someday be judged by their characters, not the color of their skin, and that all people would be free—men, women, blacks, whites, Jews, Gentiles, Protestants, Catholics, etc. 1. What is the “promissory note” to which all Americans are entitled? Echoing the words of the Declaration of Independence, Dr. King reminds his listeners that every man has a right to life, liberty, and the pursuit of happiness. The promissory note is the guarantee that all men are created equal and “fall heir” as Americans to the right to life, liberty, and the pursuit of happiness. 2. What does “unalienable rights” mean? What are these unalienable rights? Unalienable means that those rights cannot be taken away from us. Dr. King reminds us that these rights are life, liberty, and the pursuit of happiness. All three of these rights are essential; we cannot have one without the other two. 3. What does Dr. King promise will happen in America until this issue is settled? He promises that America will not rest until everyone receives full rights of citizenship in the United States. He and his fellow activists will not be satisfied until the brutality, the marginalization, and the inequality ends. 4. Why does Dr. King remind his audience of “the fierce urgency of now”? African Americans had been suffering for over 100 years because of racism, violence, and discrimination. He said that everyone—whites and blacks—must act immediately in order to change the laws and attitudes of the country. Dr. King reminded us that we can’t sit back and wait for other people to change the world; the responsibility to change our culture lies with us, right here, right now. 5. Why does Dr. King say civil rights is an issue that cannot be resolved gradually? 6. What is Dr. King’s dream? His dream was that one day Americans will realize and live out the truth that all men are created as equals. Dr. King dreamed of a time when the descendents of former slave owners and slaves could live together as brothers, and where people are judged by their character and not the color of their skin. 7. The pro-life movement has many similarities to the civil rights movement. We are striving for the day when preborn human beings are seen as equals with those who are born. When will the pro-life movement be satisfied? We will not be satisfied until abortion is abolished across America, all women and mothers are treated with the respect and dignity that they deserve, the elderly and disabled are seen as valuable members of society, and all violence and hatred against the human person is replaced with love, compassion, and forgiveness. 8. How would you summarize the pro-life movement’s dream for America? The dream of the pro-life movement for America is for all people to recognize the beauty and dignity of every human being from creation until death—that all people are treated with respect, regardless of their age, size, talents, religion, skin color, or intellect. 9. Why is it important to maintain a peaceful presence during a march and not resort to physical violence? In the March for Life, the purpose is to protest injustices against the human family. Exchanging violence with violence only continues to hurt society and does not effectively end the problem. Peaceful demonstration maintains the dignity of the movement. 10. In his speech, Dr. King quoted both the book of Isaiah and St. John the Baptist. Read Isaiah 40:4 and Luke 3:5. Why did Dr. King remind his listeners of these verses? How does this message resonate with us today in the battle for preborn children’s lives? Why it is important to recognize that we can only succeed in abolishing abortion with God’s help? Answers may vary. Help lead a discussion that includes the following: In his speech, Dr. King reminded his audience that they cannot do anything without God’s assistance. Sometimes building a culture of life amidst a culture of death seems an insurmountable task. We have to remember that we follow a Lord who can raise valleys and level mountains. This faith gives us the courage to continue, knowing that God is on our side. If we set God aside, or leave Him out, we can never hope to change hearts and minds for a culture of life. 11. How is the annual March for Life like Dr. King’s March on Washington? Like the March on Washington, the March for Life is one of the world’s largest peaceful demonstrations against the discrimination of preborn children in the womb. Like the marchers of 1963, we stand together in solidarity for the weak and marginalized members of society. We are a voice for preborn children, just as the marchers in the March on Washington voiced the cries of whites and blacks all over the country. 12. How is our own freedom “inextricably bound” to the freedom and rights of preborn children? Why? As members of the human family, when we deny the right to life to certain members of our society, we wound our society and impair our sense of justice. We can’t take away rights from one group of human beings and expect that society won’t suffer the consequences. The rights to life, liberty, and pursuit of happiness are three of many unalienable rights given to us by God. Man does not have it within his power to take away a right given by the Creator. We cannot say that all men are created equal and then deny equality to certain people. 13. Is it right to think that we should change opinions about abortion gradually? What is so urgent that we have to act now? Yes and no. Legally, we have to act now. Gradualism, as Dr. King says, is tranquilizing. It can lull us into a false belief that we will win in the end, so sometimes people don’t try as hard as they should. And sometimes they become content with only small steps. Children die every day in abortion clinics around the country. In order to build a culture of life in America, we must change hearts now and teach respect for human beings. With some people, conversion will happen right away; with others, it may take a lifetime. We can’t sit by idly believing that this change will happen on its own. Solidarity means a feeling of unity between or among people who have common goals. To have solidarity, we must empathize with our fellow man—to feel what they feel, to understand the suffering they are going through, and to walk with them every step of the way. 15. How did Dr. King appeal to this virtue in his speech? Although Dr. King did not use this word, he implied that in order to bring justice to the marginalized, whites and blacks must stand by one another. We are all Americans; we are all human beings. Part of living the American dream is having solidarity with our neighbors and fellow man. Write your own version of the “I Have a Dream” speech in which you envision a country which has made abortion illegal and preborn babies are free to grow in their mother’s wombs. Try to imitate Dr. King’s frequent use of metaphors and strong emotion. Write a poem or chant of up to 10 lines relating Dr. King’s closing words of “Let freedom ring!” or “We are free at last!” to the preborn child’s right to life. Listen to Joan Baez sing “We Shall Overcome”—a popular song during the civil rights movement. How does music help unite people? Do you think this song helped bring a sense of unity to those who marched on Washington? What about this song makes it easy for people to sing together? Answers will vary. But stress that people have a natural affinity for music. “We Shall Overcome” helped the activists in the civil rights movement feel united, just as an anthem unites citizens of a country. The lines of the song are short and repetitive, making the song easy to learn and easy to sing. Do you know of any songs that are sung as people march? Can you think of any that would be appropriate to sing? Do you know of any chants that people say at the March for Life? What does vocalizing our support for preborn children in songs or chants do for us when we march? If the lead organizer of the March for Life asked you to write a song to sing at the March for Life, what would you include in the lyrics?